This tumbler cup will keep your beverage the same temperature as long as possible and the clear lid makes it easy to drink out of on the go. This is perfect for the office, road trips, sporting events, use at home and so much more. Easy one-handed drinking from this tumbler. Take us with you as you make a positive impact and show the world who you are! Promotional launch price for this quality and couple-bundle is temporary so please buy before price goes up since supplies are limited. This is perfect for the office, road trips, sporting events, use at home and so much more. Take us with you as you make a positive impact and show the world who you are! BPA FREE & ENVIRONMENTALLY FRIENDLY - Do your part to help eliminate single use plastic bottles and cups because our tumbler cup will last you a lifetime! It is unbreakable and easy to wash, as well as equipped with a shatterproof lids seal, so you can take it with you on any adventure. LONGLASTING TEMPERATURE - Double-walled vacuum insulation maintaines the hot drink hot and the cold drink cold for hour(s). Even the ice remains frozen for hours, so your drink won't end up diluted. Normally, 80℃+ maintained within 1-hour, 50℃+ maintained within 5-hour, 5℃- maintained within 5-hour. DURABLE, CLEAN AND USER FRIENDLY - It constructed with extra thick 18/8 304 food grade stainless steel won't deteriorate over time, nor will it form cracks or leaks. It is easy to clean, and prevents build-up of bacteria and annoying odors. Our food grade stainless steel repels any lingering flavors so you can switch your drinks without any worry and they will all stay the perfect temperature. SAFE MATERIAL WITH UNIQUE TECHNOLOGY - The shatterproof lids seal is made from Tritan, which fully comply with FDA standard to free BPA. The exterior of the inner wall, in the vacuum sealed area, has been dipped in copper for added insulation. 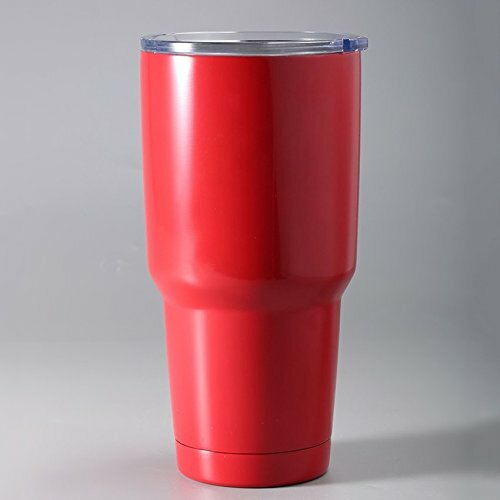 Copper reduces the transfer of temperature, adding even more insulation to your tumbler. The color is a durable coat of that won't fade, peel, or crack through extended field use and also provide additional grip to the tumbler's exterior. HUMAN-BASED DESIGN - The original design is formed with a gleaming stainless steel body shaped by slender curved, and a clear plastic lid combine for a sleek, modern look. If you have any questions about this product by HUSKEY, contact us by completing and submitting the form below. If you are looking for a specif part number, please include it with your message.